Rivne (Ukrainian: Рівне, Russian: Ровно, Rovno; Polish: Równe) is a historic city in western Ukraine and the historical region of Volhynia. It is the administrative center of the Rivne Oblast (province), as well as the surrounding Rivne Raion (district) within the oblast. 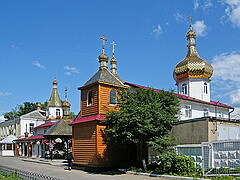 Rivne was first mentioned in 1283 as one of the inhabited places of Halych-Volhynia. From the second half of the 14th century it was under the Great Duchy of Lithuania and from 1569 in the Polish-Lithuanian Commonwealth. In 1492 the city was granted Magdeburg rights. Following the partition of Poland, in 1793 Rivne became a part of Russian Empire, and in 1797 it was declared as a regional town of the Volhynian Governorate. During World War I and the period of chaos shortly after, it was briefly under German, Ukrainian, Bolshevik, and Polish forces. In April–May 1919 Rivne served as the temporary capital of Ukrainian People's Republic. At the conclusion of the conflict, in accordance with the Riga Peace Treaty of 1921 it became a part of Polish Volhynian Voivodeship for the period between the two World Wars. In 1939, as a result of the Molotov-Ribbentrop Pact and the partition of Poland, Rivne was occupied by the Soviet Union. 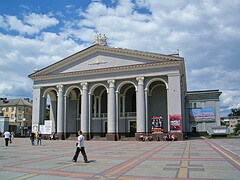 From December of the same year Rivne became the centre of the newly established Rivne Oblast, within the Ukrainian SSR. 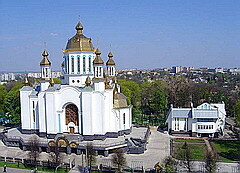 A being an important cultural centre, Rivne hosts a humanities and a hydro-engineering university, as well as a faculty of the Kiev State Institute of Culture, and medical and musical as well as automobile-construction, commercial, textile, agricultural and cooperative polytechnic colleges. 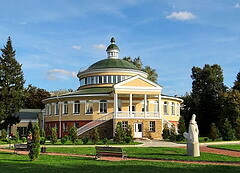 The city has a historical museum. The Academy was founded by Constantine Ostrog. He was the first in Ukraine Greek-Slavonic school. The first rector was Gerasim Smotrytsky, among the teachers there were highly educated and well-known personalities of the time. To study in the school people came from Galicia and Lithuania. Hetman Petro Konashevych Sahaidachny also had been studying in Ostrog Academy. Different languages were taught in the Academy: Slavic, Greek, Latin, grammar, arithmetic, logic, rhetoric. City is famous for its sightseeings such as Basalt columns and Tunnel of Love! 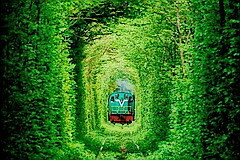 Tunnel of love in the village of Klevan is considered to be one of the most beautiful places in the world. Natural fence made of trees and shrubs formed a kind of tunnel over the railway tracks near the station "Klevan". Looking at these thickets, it is impossible to believe in their natural origin, that's unbelievable but true! Trees are used to be trimmed all the time but at some point, local governments rejected this idea. The trees formed a "grotto" and they climbed up the trunks of herbaceous vegetation. Visiting the tunnel is considered a good omen, and when the weather is warm Tunnel of love becomes a venue for photography hundreds of newlyweds. This stones are a chronicle of geological processes. They are unique in that we see in reality vintage rock. Studying basalt columns, their behavior we study ancient volcanic activity. Basalt occurred the field and monolith columns. 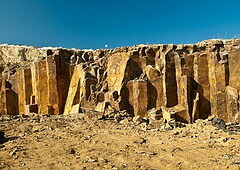 Its column alike formation of basalt in such amount is unique in Ukraine. There is no other field like this in Ukraine. Their height ranges between three and thirty meters. A classicism-style gymnasium building (1839).